And 'Think Green' grocery bag. I bought once this eco fabric, not realising, that it was home dec weight. The only right thing to do with it, was to make an eco grocery bag. 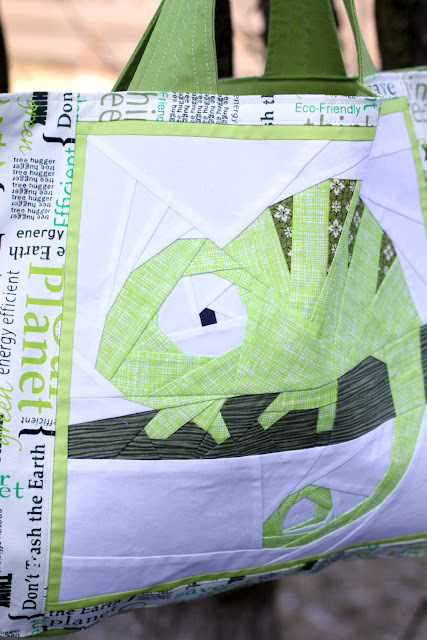 I matched it with some green fabric of the same weight which I found in my stash and added Carl the Cameleon block to the front. I designed that pattern long time ago and sewing the bag gave me the reason to finish it. I eko torba 'Think Green'. Kiedys kupilam ten zielony material z haslami propagujacymi ochrone przyrody, nie zdajac sobie sprawy ze jest grubszy niz zwykle materialy patchworkowe. Jedyne wyjscie jakie mialam, to uszycie z niego eko torby na zakupy. Dodalam troche jednokolorowej grubej bawelny i blok z Carlem Kameleonem na przod. Thank you for all emails and comments! I will answer all soon. Dziekuje ze wszystkie komentarze! Postaram sie jak najszybciej na nie odpowiedziec. Carl is fantastic on your shopping bag. I would love to test him or your phone, if you are still looking for people. I'm not a blogger but my flickr stream is RabidChipmunks, if you want to see my work. I would love to chat with you when you have time. My email is bsymscott *at* gmail.com. Can't wait to hear from you and again congrats on another stunning design. great! you are so talented. This is great!!! 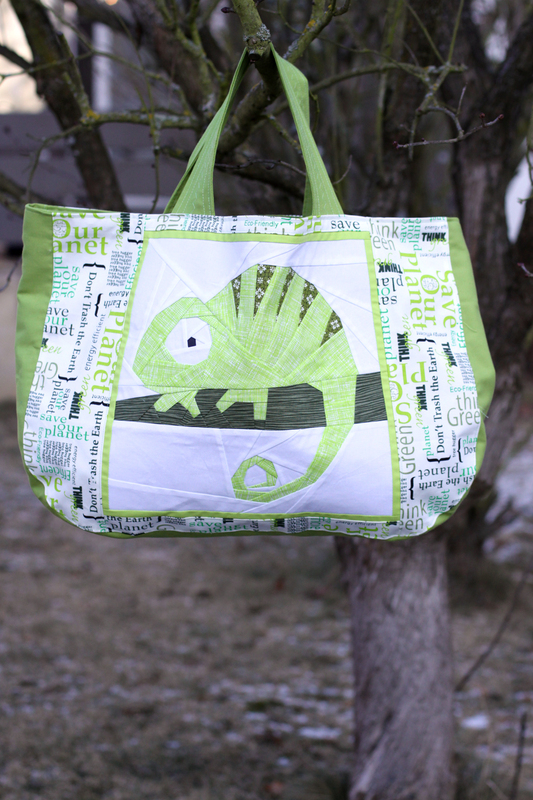 Too cute to use at the grocery store though... What a great project bag or purse! I would love to test either of your patterns (the lizard is my favourite.) I'm a paper piecing fanatic. Youcan see my work in my Flickr photostream here. Right now almost everything on that page is paper pieced! He's pretty darn cute he is! I would love to test your pattern. Ive never really followed someone else's pattern but have drawn up my own. I have a pin board full of patterns I would love to try. I'd love to test both patterns. If you're looking for a beginner to test, I would love to volunteer. Both of these patterns are fantastic! Carl mnie absolutnie zachwycił :D Z chęcią spróbowałabym wymodzić własnego kameleona, ale pewnie bym nie ogarnęła jak go uszyć. This is awesome, love the block and on the bag it's wonderful. 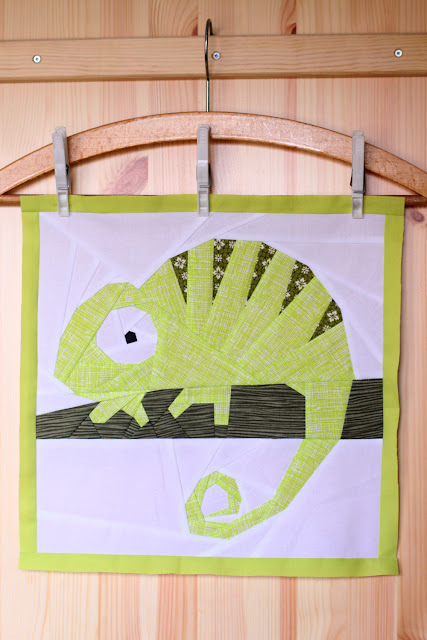 I've been sewing for years but am a novice paper piecer so if you want a beginner to test it I would be delighted. I also would like to test. Where can i find the Camälion?? omigosh! i would love to test both!! especially the phone. or are you done with the "testing" phase now and on to the selling? let me know! the bag looks incredible, btw. probably the best looking grocery bag ever! OMG this is such a great bag. Beautiful work! Love this design! Absolutely fantastic! I love your chameleon - he is super cute!